Last edited by musouka on Tue May 13, 2008 6:13 am, edited 20 times in total. I guess fanfics, like children, take a village to raise. First of all, if this fic is my baby, then Raelle is the father; without her support and imput, this fic wouldn't be here. It's as much hers as it is mine. It's as simple as that. CFTF is its godfather; thank you so much for putting up with us during the long months of hammering and fangirling. Your willingness to read and comment means so much for me. Same with my little brother, for helping me keep everyone in character and for reading this sucker out loud who knows how many times. Thank you to Lyssie for your encouragement; without your inspiring artwork it could have very well taken me even longer. Thank you to Julie for correcting my horrible grammar and being willing to invest your energy in a virtual stranger's work; you're an amazing beta and I'm honored for your time. This fic takes place a year after the events of GS3. It is an AU that branches off the canon timeline at a certain point. Therefore there will be spoilers. The courthouse always looked different to Phoenix right after he finished a case. It wasn’t just the looks on the faces of the people as they exited—talking to one another in hushed whispers and darting glances at him as he passed—but the walls themselves seemed changed, expanded. Usually in a good way, like that feeling of taking a deep breath of fresh air. But after a case like that one, all he really wanted to do was go and take a long nap, preferably in a place without irritating prosecutors and accidental homicides centering around plungers. On his way in, the walk to the courtroom doors always seemed too short, but today especially it felt like the walk towards the exit took half an hour. Part of it was the crowd. As he pushed past an older woman and what he assumed was her son, he felt like he had just exited a long, drawn out movie, with the tired, vaguely annoyed feeling that entailed. Too many people in one spot, moving in different directions. All the courtroom lobbies on the first level spilled out into the main foyer of the building, a large, high-ceilinged lobby paneled with the same wood as the other waiting rooms, only with benches all along the perimeter instead of couches. There people sat, engrossed in documents, glaring furiously at their lawyers, children sleeping in their mother’s laps, and, in the case of one overzealous couple: making out. Phoenix averted his eyes and focused on the exit doors instead. Almost there. He reached to open the nearest one. For a brief moment, Phoenix considered continuing out the front as if he hadn’t heard Gumshoe. His dress shirt was sticking to his back underneath his navy blue suit and he felt vaguely achy from standing so long; the post-trial high had already begun to wear off. The moment passed. Phoenix turned to face the taller man, who was now breathing heavily from his mad dash across the room. “What can I do for you, detective?” He sighed. “Top…you mean Maya?” Phoenix asked. A man hefting a box of evidence cut between them abruptly, so Phoenix moved off to the side of the exit to continue their conversation. Privately, Phoenix agreed. It never seemed quite right to go to trial without her standing by his side, not hearing her exclamations and encouragement. It had been especially strange to be met with an empty space where she should have been when he turned to see her reaction to the witness’s testimony. “She was called back to Kurain this morning. There was some sort of emergency.” He tried to quash an irrational surge of irritation. Over the past year, Maya’s duties had left him less and less time with her. She’d managed to make all of his trials except this one, but Phoenix hoped this wasn’t a trend in the making. Gumshoe nodded and stared at Phoenix expectantly. Phoenix waited. “…Nice seeing you, detective. Now, if you’ll excuse me…” The defense attorney turned to escape. “What?” Phoenix asked, scraping the bottom of his finite reserve of politeness. “I’m sorry. It’s just…I’ve had a long day, and I’d like to get home. So unless there’s anything you need…” Phoenix gazed out the glass doors longingly. He was pretty sure he’d missed his bus by now. Phoenix frowned. It’s obviously not that important if he won’t tell me what it is! That was good to hear. A few months earlier, Edgeworth had returned to LA just as quickly as he left after his first—and last—trial as a defense attorney. From the way he had spoken before they parted ways, more than a year ago, Phoenix hadn’t expected him to come back so soon. There had been undercurrents that he might not come back at all. Phoenix had refused to entertain that possibility. Yet, here he was. Somehow. He had taken up his old job at the Prosecutor’s Office, and, by all reports, was busy striking terror in the hearts of young defense attorneys throughout the district. It was Gumshoe that had informed everyone that their old friend was returning and had organized the welcome back party and greeting at the airport. Phoenix could still remember the look on Edgeworth’s face as he’d come down the escalator to the baggage claim and saw everyone there. As soon as they caught sight of that unmistakable pink suit and cravat, Maya had hefted the hand-made sign reading “Welcome Home, Miles Edgeworth” far above her head, forcing Pearl to stand on tiptoes to hold her end up to make it readable, if still lop-sided. Both Larry and Gumshoe had started waving furiously, as though Edgeworth might somehow miss the detective towering over the two girls in their medium gear, not to mention Larry’s bright orange jacket. And Phoenix had just smiled. It was so good to have him back. The prosecutor had swallowed convulsively, the corner of his mouth twitching as though it couldn’t quite decide the proper emotion to display. He’d finally settled on a frown once he reached the group. The first words out of his mouth were painfully stilted, about how unnecessary “all this” was. Phoenix hadn’t seen much of him after the subsequent party. He’d considered giving Edgeworth a call a couple of times, but talked himself out of it, thinking about how busy he must be trying to get settled back in. Most of their interaction had been limited to nodding at one another in the court hallways when they passed; they hadn’t been assigned any cases opposite one another yet. There was no rush. Edgeworth was back. It would happen eventually. All the same, Phoenix didn’t feel like sitting through another trial this afternoon, especially one that he wasn’t even participating in. “I don't think—“ But Gumshoe had already made up his mind for him; a large hand grabbing his upper arm and a quick pull cut him off. “Come on, pal. You’re coming with me!” Gumshoe said. Phoenix resigned himself as he was dragged through a crowd of people leaving courtroom number one. Many of them turned and stared curiously in the two men’s wake. Gumshoe seemed oblivious as he took a quick left where the hallway branched. They moved past several paintings, another couch, and finally settled next to a bushy plant in a white planter—far away from the exit and all its seductive charms. Gumshoe let him go. Don’t make me sue you! Phoenix rubbed his arm. The elevators in the courthouse were painfully slow, so Phoenix had plenty of time to inspect the buttons—round, numbers rubbing off from use—and ceiling—mirrored—on their ascent to the third floor. The thin carpeting in the front corner on Gumshoe’s left was frayed and curling. There was also a faint suggestion of the smell of mildew in the air; Phoenix didn’t want to think about the how or why of that one. “Are you testifying today?” Phoenix finally asked the detective. Looks like it didn’t go so well… Phoenix shifted as the elevator shuddered on its climb. I guess that’s easy to say when you can’t afford cable. Or a television set. Just then, the elevator eased to a stop and the doors opened. The two of them stepped out into the paneled hallway. Courtroom seven was straight ahead—it was the closest of the three on the third floor. As they approached the lobby, Phoenix saw the heavy doors to the entrance were open, signifying that the trial was in recess. Phoenix glanced around, but there was no sign of Edgeworth in the surprisingly thick crowd. He’s probably prepping a witness, or making sure his cravat is straight. On the other hand, he could see what he assumed was the defense attorney for the case sitting on the ubiquitous red lobby couch across the way, a folder thick with documents at his side. He was talking to a man Phoenix assumed was his client. The attorney looked about Phoenix’s age—in his late twenties—with non-descript, regular features and build. Even his suit was a dull gray. The thing that stood out the most was his hair. Though it was also an unremarkable brown shade, it looked as though he had rolled out of bed, put on his suit, and run to the courthouse without even stopping to comb it. As Phoenix watched, the lawyer ran his fingers through his hair in a nervous gesture; that explained the odd styling choice. The client’s suit looked much more expensive than his attorney’s, which was usually the case in Phoenix’s experience; it was jet black and appeared custom-fitted. His dark hair was slicked back and looked so heavily greased that Phoenix half expected to see a rainbowed oil sheen when it caught the light. The man gestured to his attorney; Phoenix could hear bits and pieces of the conversation over the crowd noise. They’re talking about Edgeworth? Phoenix moved closer. Phoenix nodded, distracted, and kept moving towards the couch. The bailiff called the end of recess, cutting off whatever the attorney was about to say. The defense attorney sighed and heaved himself off the couch. Attorneys didn’t have to go in until the crowd was seated, but it was getting thick over here so Phoenix could understand wanting to relocate. Phoenix turned to look for Gumshoe, but couldn’t see the man in the flood of people moving towards the courtroom. He waited for a few moments before plunging into the crowd; Gumshoe was instantly recognizable, how hard could it be to find him? Pretty hard, actually, Phoenix discovered. After several minutes of apologizing for getting in other peoples' way, he gave up going by height and instead focused on spotting the man’s dark brown coat. As the crowd thinned, he finally saw the detective over by the front of the doors talking to one of the guards. “Detective Gumshoe!” he called. Gumshoe lifted his head and waited for Phoenix to make his way to the doorway. It’s not like we had a set meeting spot or anything, Phoenix inwardly protested. But he nodded and fell into step as Gumshoe waved goodbye to the guard and they made their way inside. Gumshoe started down the left—Edgeworth’s side—automatically. Phoenix shrugged and followed. “I think that side is full up,” the bailiff said. Gumshoe glanced at Phoenix, as if to say ‘this is your fault, pal’, but said nothing as they veered to the right instead. Phoenix found it slightly disorienting to head past the defense bench to the hidden set of stairs next to the judge’s bench and up into the public gallery. Gumshoe’s clomping footsteps were heavy behind him. The detective nearly ran into Phoenix’s back when he stopped at the top to survey the seating options. Instead of chairs there were three long rows of benches—not unlike church pews—that ran the entire length of the box. It was already crowded and growing more so as others shoved past Phoenix, turning to glare at him for blocking the way. Phoenix hurriedly took a seat near the end of one of the benches; Gumshoe settled in beside him. A quick glance across the way told him that the bailiff had been correct; Edgeworth’s side was even more packed than this one. It was strange; he hadn’t heard anything about Edgeworth taking a high profile case—and that was the sort of thing that usually got around. Granted, it wasn’t nearly as full as Engarde’s trial was—that had been standing room only—but this crowd was nothing to sneeze at. “What did happen yesterday?” Phoenix asked. “It was a real mess, pal. It should have been an open and shut case, but—” Gumshoe broke off as Edgeworth made his entrance. It would have been impossible to miss Edgeworth even without the signature pink and ruffles. Despite Gumshoe's earlier words about the state of the case, his stride was utterly confident. As soon as he made it to the prosecutor's bench, he began to shuffle through papers in quick, familiar motions, without sparing a glance for anything else. Watching him made that sense of disorientation come back in full force. The angle seemed wrong, like he was too far away from where he was supposed to be. With Edgeworth in the same room the feeling that he should be down there, across from him, was multiplied ten-fold. Phoenix’s thoughts were interrupted by the familiar sound of the judge’s gavel slamming down, officially beginning the trial once again. The murmuring filling the room settled into a sort of expectant calm. “Now, shall we resume?” the judge asked, settling into his chair. “The prosecution is ready, Your Honor,” Edgeworth said, pushing his papers to the side in two neat piles. “The defense is, uh, ready as well, Your Honor,” the defense attorney responded, looking anything but. He was still scrambling to get everything properly organized. This is like watching a “fight” between a hawk and a mouse… Looking at the two of them, Phoenix couldn’t help but feel a twinge of pity for the defense—though that led to the uncomfortable thought of other people watching from up here and pitying him. “The prosecution is ready to call its second witness,” Edgeworth said. The judge acquiesced with a nod. While they waited for the bailiff to bring him or her in, Phoenix took the time to study the defendant. The defendant appeared to have split in two. One in the suit he’d seen in the lobby, the other in a stained mechanic’s uniform. The one in the suit had a small bandage on his hand near his thumb; the other’s entire hand was wrapped in thick, white gauze. Twins, huh? Phoenix thought he now had a pretty good idea of what went wrong with yesterday’s trial. It was easy to imagine the look on Edgeworth’s face when that little tidbit of information was brought to light. Especially if it had been a surprise. There were few things the prosecutor liked less than “surprises” disrupting his trials. Poor Gumshoe. It was equally easy to imagine the tongue lashing the detective had gotten because of that oversight. No wonder he was so depressed earlier. The bailiff announced the new witness, a young woman Phoenix estimated to be in her early twenties. Her hair was dark brown and tied back in a high ponytail. She was wearing a white lab coat—Phoenix assumed that she was CSI, meaning she worked for Edgeworth—but the pastel pink shirt peeking out from underneath was surprisingly casual for someone working on the force, as were the belt and blue jeans. Then again, Phoenix had seen a lot of pretty unusual outfits when it came to his dealings with the police. This wasn’t even on the radar compared to some. She had a nametag clipped to the coat, but it was too difficult to read at this angle, even though he squinted desperately, trying to remember where he’d seen her, hoping her name would jog his memory. She seemed so familiar. A pair of glasses were perched high on her head, above her bangs. As she was led to the stand she adjusted them in a quick motion. “Ema Skye, I’m an SOCO…sorry, forensic science technician with the police department,” she said. “That’s right, pal!” Gumshoe didn’t bother hiding his delight at Phoenix’s stunned silence. “Just about a month ago. Passed the test into the CSI division by the skin of her teeth. She's worked a couple cases before this, but this is the first time she's testified in a trial,” Gumshoe hurriedly explained. Phoenix frowned to himself. He didn’t know the entire background on the case, but if this was what Edgeworth’s case hinged upon, and what Seize said was true, it seemed to be a particularly slender rope to hang a man. Unless the sink’s handle was the murder weapon. But Edgeworth seemed unruffled by the change in Seize’s attitude. He’s completely sure Black is guilty, Phoenix realized. There must have been more to those fingerprints than met the eye. Now it was Edgeworth’s turn to smirk and shake his head as though he pitied Seize. Having been on the receiving end of the smirk-and-shrug combination more times than he liked, Phoenix knew Edgeworth was about to unleash something pivotal Seize was overlooking. Suddenly Phoenix was glad he wasn’t down there for a change. “Ms. Skye, please testify as to what else you found in the kitchen,” Edgeworth interrupted. At that, Black got up and slowly sauntered to the witness stand. When he cleared his throat loudly, Ema stepped aside so he could address the judge, but not before glancing at Edgeworth again. He gave a curt nod in response. “I have something to say,” Black tossed his words out carelessly. “No objections, Your Honor.” Far from it—he looked like a thirsty man just given a glass of cold water. Ema took a seat on Edgeworth’s side as Black moved into place, but Phoenix found himself studying the prosecutor instead. He’d added a few strands to his rope, but not even the notoriously fickle judge was jumping to pronounce Black guilty. “Your brother testified that he’d never even seen the victim before,” Edgeworth replied. Ignoring the explanation for the fingerprints? That’s strange. Phoenix didn’t realize how far forward he was leaning until he nearly slipped off the edge of the bench. Luckily he caught himself from falling in time to hear Black’s response. Black’s brother showed no reaction to the statement except a slight stiffening in his shoulders, like the chair had gotten a little harder, a little more uncomfortable. Edgeworth stood silent, as if waiting for something. “You’re sure you washed your hands after she cleaned up, defendant?” Edgeworth asked. The room exploded in a frenzy of loud whispers. I hope he knows what he’s doing, because I’m not following, Phoenix thought. The judge banged his gavel and called for order, with limited success. Though it all Edgeworth stood quietly with his arms folded, the calm eye of the storm raging in the courtroom. What followed was familiar to Phoenix as a lawyer. Even removed from the action and barely following the case, he was surprised to find his pulse racing at the rapid volley of objections and counter objections. The dull sound of hands thudding against wood reverberated through the air. The judge’s head jerked back and forth, like he was watching a particularly heated ping-pong match. The point of contention had shifted to the chef’s knife. After the court finally settled down, Edgeworth went on to explain that due to the blood residue found in the kitchen sink, and the way the knife’s handle had been wiped, they knew it had been washed. Since the victim was in no condition to wash the knife after being stabbed nine times, that left the murderer. And there was only one set of prints aside from the victim’s on the sink’s handle: Black’s. Seize wasn’t going down without a fight, but he wasn’t gaining any ground against Ema and Edgeworth. Every time he tried to interject, Edgeworth would swoop in, turn things around, and prompt Ema to continue testifying. Watching the two of them, Phoenix was reminded of something that Gumshoe said a long time ago, about the bond of trust between those that worked on the police force and the prosecutors. At the time, he hadn’t really understood. Both of them were working together to build a wall. Bit by bit, the evidence mounted. It was something that would have been impossible to grasp if not for his current observation point. If he was down there, he’d be too busy dismantling that wall—probing for its weak spots—to appreciate the work and trust that went into building it in the first place. He could have pointed that out ten minutes ago, instead of arguing that his client didn’t touch the sink in the first place, Phoenix noted, glad the attorney finally picked up on something that had been nagging him for the past few minutes. This time Edgeworth didn’t even have to say anything. “I already thought of that,” Ema replied, with a jaunty tilt to her chin and a smug grin on her face. “You did?” Seize said, visibly deflating. “B-but! Then you don’t know whose it was! It could have been from the victim!” Seize protested. “You have a wife, don’t you, Mr. Seize?” Ema suddenly asked, looking serious. “Have you ever compared your hands to your wife’s hands? Like, held them up to one another?” she interrupted. There was a pregnant pause. Seize suddenly seemed to find the top of his desk absolutely fascinating. Silence spread thickly over the court. It felt as though everyone was holding his or her breath, eyes beating with laser-like focus on the defense’s bench. “Mr. Seize?” the judge prompted. “Just Mr. Black, to make sure the size was a possible match,” she said, a note of caution coloring her voice. Beside Phoenix, Gumshoe made a sympathetic hiss. “Ouch, that one hit a raw nerve.” At Phoenix’s curious look, he clarified, "the prosecutor in charge of her first case caught a bad mistake she made during the investigation. Happened just a few weeks ago. Gotta sting when a fellow rookie humiliates you in front of your entire department, pal." “Ms. Skye,” Edgeworth began. Far from relieving Ema’s tension, she actually jerked at the sound of her name. “There was no reason to check the prints of those working on the investigation!” she said, speaking over Edgeworth. It was the first time she hadn’t let him say his piece. Edgeworth looked vaguely surprised, an expression Phoenix was sure he mirrored. “But there’s always the possibility…” Seize trailed off. “You don’t seem so sure, Miss Skye...” Seize’s smugness seemed unbearable. Ema’s gaze was directed at the ceiling—her throat constricting—and then, slowly, the floor. Anywhere, it seemed, except in Edgeworth’s direction. It was a pronouncement. A statement of fact, not a suggestion. And, for a moment, Phoenix forgot to breathe. In Edgeworth's objection, he heard a faint echo of nineteen years ago—the tinge of a high and youthful voice, utterly sure, calling out to protect the wrongfully accused. Phoenix had assumed that part of Edgeworth had been strangled in the aftermath of DL-6 and had adjusted his image of his old friend accordingly. It never occurred to Phoenix that impulse had been channeled in another direction. Even now, Miles Edgeworth was still defending people. “You don’t know that they didn’t,” Seize replied. “Yes. As Ms. Skye said, there was no reason to check it against the investigation team’s prints. It had to come from the murderer,” Edgeworth said. Phoenix saw Seize’s eyes racing, as though the answer to his predicament stood invisible in front of him, if he could only read it. Don’t bother, Phoenix wordlessly responded. Somehow he managed to do it. Even without a single identifiable print on the murder weapon. It was clear Edgeworth’s time in Europe had left him sharp as ever. “Hold it!” Seize’s voice was loud, but still quavered. “His brother’s fingerprints weren’t on the sink,” Edgeworth parried, looking bored. Even Phoenix was taken aback. Poor Edgeworth. I’m not sure I could respond to that either. “You have no rebuttal?” the judge asked, looking surprised. Seize stood there shell-shocked, blinking rapidly like he expected the scene before him to melt away at any moment. “I…that’s…” Edgeworth made a valiant effort to collect himself. “…not possible. They don’t have identical fingerprints,” he finally managed to spit out, straightening up. Edgeworth reeled once more. Phoenix winced. Sure, by now there had been plenty of times Edgeworth’s trials had gone south at the last minute, but generally because he had pointed the finger at the wrong person, not because the judge wasn’t up on his genetics. Seize shifted awkwardly. Probably doesn’t know if he should step in and help or take the verdict and run. Phoenix knew what he would do, but not all defense attorneys were like him. Still, for some reason…it grated to see Edgeworth put in this position. Perhaps it was because Phoenix could remember all the times Edgeworth had stepped in on his behalf, even against the prosecutor’s best interests. “Are you okay, pal?” Gumshoe whispered. Phoenix started at the sound. Looking down, he saw his hands were balled against his pants, material clenched tightly in his fingers. “But, if they’re twins, they were both in the same womb at the same time,” the judge protested. Hey, shouldn’t this be the defense attorney’s job? Not really, no. But Phoenix had to smile regardless; seeing this side of Ema was like seeing an old, though still slightly incoherent, friend. “Thank you, Your Honor.” Ema smiled. Wait, it actually worked? Phoenix sighed; upon reflection, this probably didn’t even make the top ten of the craziest things he’d ever seen at a trial. “All right, now that everything is finally settled, and if we’re done wasting time—“ That was aimed in Seize’s general direction. “—I think we can all agree on the proper verdict,” the judge said. He’s the one that caused the delay. Phoenix rolled his eyes. Seize seemed to fold in on himself before sighing and nodding his head in acceptance. “Hold it!” rang out once again through the courtroom. Phoenix manfully resisted the urge to lower his face into his hands—and he thought his trial today had been a pain. Was every day in court like this for Edgeworth? “Mr. Seize…” the judge began. “It wasn’t me, Your Honor,” Seize protested, jerking his head towards the witness stand like he was physically trying to shake the judge’s glare off. It was Black, breathing heavily. He leaned over the podium, trying to get as close to the judge as possible, ignoring both prosecutor and defense attorney. Great rivulets of sweat streamed down his face; tendrils of his hair escaped his previously perfectly coifed, slicked back style and stuck plastered against his forehead. Ema stood off to the side, rubbing her arm from where Black shoved her out of the way, brows furrowed. Edgeworth’s face was an unreadable mask; it was impossible for Phoenix to tell if this was something the prosecutor planned or if it was another unexpected upset. He was surprisingly calm if it was the latter. He’s not doing much to make himself look innocent. Phoenix turned to Gumshoe to gauge his reaction to all this. The detective’s eyes remained fixed on the raving man below, back tense. “…nothing!” The last of the bandage flew off; Black flung it to the floor as though punctuating his final yell. When no one responded, he stood there panting, hands gripping the edge of the witness stand so tightly his knuckles turned white. Finally: “Mr. Black, what is that on your hand?” Edgeworth’s voice was deadly calm, quiet, yet somehow it seemed louder than Black’s roaring. Black clapped his hand over the other, all color bleeding from his face. Too late, even Phoenix had seen the five gouges around the area of his thumb, stark red against his tense, pale hands. The marks a woman with long fingernails, clawing and grasping for her life, would leave. “T-that’s…” He turned to look over his shoulder. The guards moved closer to the exit in response. Things moved quickly after that. The judge read the verdict, a foregone conclusion at this point. Black made no move to struggle when the guards came up to the stand, wrenched his arms behind his back, and led him away. All of this happened in the corner of Phoenix’s vision. His eyes, his focus, remained on Edgeworth. Gumshoe and Phoenix waited until the crowd thinned before leaving the courtroom. Both Edgeworth and Seize had packed up quickly and left—after the typical scheduling of post-trial meetings—before the last of the crowd dispersed. Phoenix hadn’t realized how muggy it was inside until he exited and the relatively fresh air ran cold against his skin. “Wasn’t that something, pal?” Gumshoe beamed as though he’d put Black away himself. “It really was,” Phoenix admitted, remembering the look of tired contentment that had settled on Edgeworth’s face as the verdict was passed down—so different from his usual victorious smirk. He was right. I’m glad I came. “Ema was great, huh?” Gumshoe said. “And Mr. Edgeworth…“ Gumshoe stopped. It seemed they both caught sight of the prosecutor at the same time. He was standing over on the far side of the lobby, Ema facing him, nodding at something she was saying. “Hey, Mr. Edgeworth!” Gumshoe bellowed across the room. Edgeworth’s head flew up—he must be used to it too, Phoenix thought. As they closed the gap, he and Edgeworth locked eyes. Phoenix saw Edgeworth stiffen in recognition, a complex mixture of emotions flickering across his face—too rapid for Phoenix to read—before he collected himself. “Wright, what are you doing here?” It wasn’t hostile, but it was abrupt. Nice to see you too, Edgeworth. That answered the question of whether the prosecutor had noticed his presence during the trial. Phoenix was suddenly reminded of Edgeworth’s aversion to surprises. Ema turned around at the name “Wright”. Underneath the veneer of the young woman, he saw traces of the teenager he remembered in the delighted grin quickly spreading from ear to ear. “Detective Gumshoe brought me to see your first trial,” Phoenix said. Edgeworth seemed to relax at that. “Well, I am a professional, Detective,” Ema replied. But she was smiling. “Intern?” Phoenix asked. He didn’t tell me anything about that. On giving it thought, it was true that Ema would have been unusually young for a fully licensed forensic scientist, but stranger things had happened in this precinct. Or they were desperate. That seemed a more likely scenario. “I was supposed to testify at an earlier trial, but…” Ema trailed off, biting her lip. Her earlier confidence seemed to waver at the recollection. That's right. “Detective Gumshoe told me what happened,” Phoenix said. Ema blinked in surprise, then shot a look at Gumshoe, who raised his hands defensively. Phoenix saw the long-dormant embers of a schoolgirl crush pop and spark in her gaze, before dying back down into a respectful, professional admiration. If Edgeworth noticed, he gave no sign. He was too busy examining the ceiling and the surrounding walls—not meeting anyone's gaze. Phoenix turned around. For a moment, he didn’t recognize the woman with the quiet smile and laugh lines etched beneath her eyes; his memories were of her in jail, expression pale and taut. “Yes, I got out early,” Lana said. The two sisters looked at one another. Phoenix thought they were going to hug, but instead Lana put her arm around Ema’s shoulders and gave a quick squeeze. “This is quite a reunion,” she said, looking at Phoenix. “It is,” he said, quietly. He was glad to see she was doing all right. If possible, her eyes warmed further. It felt like stepping into a sunny patch of light. Phoenix was struck even further by how different she was from when he had defended her in court, when her words had cut and her gaze was ice. “I was just telling Mr. Edgeworth what an honor it was working with him,” Ema said to her sister. Inwardly, Phoenix winced reflexively, already anticipating the bill that would inevitably fall to him. Still, he thought, listening to Ema's voice rise with excitement, it might not be a bad idea. Still a little bit awkward, huh? Phoenix smiled. It was to be expected. Ema left while Lana was still in jail, and while he was sure they’d been in contact, they probably hadn’t had much time face-to-face yet. “No, no,” Ema exclaimed, hastily. “I'm sure we can pull up another table. Right, Sis?” She looked over her shoulder at Lana for confirmation. And that is why Detective Gumshoe has trouble paying his rent, Phoenix inwardly sighed. Gumshoe gave her a thumbs-up before beating a hasty retreat down the hall. Edgeworth, meanwhile, was looking at Lana again, and Phoenix once more got the impression they were speaking without words. He seemed to come to a decision. Ouch, why doesn’t he just use the good old ‘I have to wash my hair’? But that slight hesitation had told Phoenix all he needed to know. There would be plenty of time to get re-acquainted with Ema; tonight, her sister came first. “What about you, Mr. Wright?” Ema asked. “No,” he said, “I've really got to be getting back, too.” I was planning on having been home hours before now, anyway. He thought he saw Edgeworth nod at him, subtly, from the corner of his eye. “A pleasure, as always, Mr. Wright,” she added, turning once more to Phoenix. Ema grinned at him once more, adjusting the goggles resting on her head, before following her sister at a brisk stride towards the courthouse exit. “She’s a defense attorney now,” Edgeworth said. Phoenix blinked in surprise. That wasn’t a career choice he had expected for Lana Skye. Technically, he supposed that it made sense, as her ties to the Prosecutor's Office had been irrevocably cut—but the option of working for the opposite bench had honestly never occurred to him. Thinking of Lana's smile, and the gentle encouragement she had given her sister, though, he thought it was probably the best thing for her. In the back of his mind, he recalled that faint echo of Mia that had startled him when he had first met the former Chief Prosecutor, more than three years ago. “As long as she’s happy,” Phoenix said. She certainly seemed so. Edgeworth nodded, and the conversation lapsed into a familiar, slightly uncomfortable silence. Phoenix wondered why one of them didn’t take their leave and be done with it; they’d both had long days. Just a few hours ago, his greatest wish was to take a shower and a nap. It was hard to imagine Edgeworth didn’t feel the same way; the edges of his dark bangs still clung to his forehead and, this close, the circles under his eyes were obvious. So Phoenix was just as surprised as Edgeworth when the words out of his mouth weren’t ‘see you around’. I'm so glad you finally finished... the beginning. You just caught my heart with that story, pal. I look forward to the next chapter~. Naru/Mitsu~ Naru/Mitsu~ I'm a little lad who loves Naru/Mitsu! I--only half jokingly--referred to it several times as the worst P/E fic ever while writing it, if only because there's such a singluar lack of the pairing in the first chapter. Don't. Please. That's one of the reasons I loved this chapter so much. Far too often to I find fanauthors are so eager to rush headlong into the romance that they completely push aside any effort to build up to it, and in the long run it makes the completed story feel rushed and lacking. You're at least taking the time to build up a basis for their relationship, and as the reader I can't thank you enough for that. I also loved the trial, and the way Edgeworth and Ema played off each other. She admittingly wasn't one of my favorite characters in Ace Attorney (she felt too much like Maya II to me), but you really brought her into her own here. Mu knows she's really not the worst. At least, she should, or we beat her with (foam) bats. Because this is still amazing. Nah, it's ok. :P I realized it was you as soon as I saw your first post and then I wanted to slam my head into the monitor because it all seemed so obvious. Thank you, that really means a lot to me. As Funk, Raelle and everyone else I mentioned in my notes knows veeery well, it was something I was nervous about, but I do think a relationship like P/E requires a lot of careful build-up before any sort of honestly romantic moment can happen. Even if I wanted to skip right to the good stuff, I wouldn't be able to--not if I wanted it to come across authentically. Hahaha, I'm really really happy someone mentioned Ema! To be as vague as possible, it was very difficult trying to find a balance between how she was back then and what we know of her now, coupled with the fact that she's still very young and not quite in the same position in this AU. (Whew, that's nebulous) But, I'm happy with what we came up with, and I'm glad you enjoyed her too. I reread it, and it's still awesome. You must have been bored today. I always like a good romantic / fan fiction! So if I have to wait a little longer for the next chapter it will be worth it. I like a man with a big ... vocabulary. I really love this story BECAUSE of the court section. It brought in so many small elements that are present throughout the games and it was lovely to see (albeit through Phoenix's eyes) the court action without being involved. I'm also of the "slow burn" mindset in regard to P&E and in fact in my mind I'm still on the fence about whether when it comes to it they would choose to make the leap. Take as much time as you like! I'm really savouring the story! I had a vague feeling that I was building my hopes too high for this, as my mind runs on the process of grass on the other side is always greener, but you've managed to hop, skip, jump and cartwheel above all of my expectations. The fact there is pretty much no hint of P/E at all really echoes the feel of the games (starting out slow and comfy, introducing a shock factor, building in to a frantic crescendo and revelling in the pure energy of it's climax) and works brilliantally for the characters concerned- It took 17 years for them to even reach the level of trust they are at now. Ah! When this came to the top of the list I thought you'd added more. *weeps*. I'm a sucker for P/E. One of my biggest pet peeves is when people just bull rush to the romance, with little or no development involved, so yay! This chapter has MAJOR GS3 spoilers! You have been warned. Phoenix didn’t know exactly what answer he’d expected from Edgeworth upon his invitation, but it hadn’t been this long, painful stretch of silence. He shifted his weight on to his other foot as he waited, seconds slowing down to hours. Edgeworth’s non-response seemed to come in stages. First, a blank stare, as though he had failed to register what Phoenix had just said. Then his eyes slid to the direction of the exit behind the defense attorney, as though he wanted to escape the awkward situation entirely. Finally he returned his attention back to the court files still in his arms—a different sort of evasion. By this point Phoenix was sure the other man was trying to come up with a better excuse than ‘filing paperwork’. While Phoenix appreciated the sentiment, he was entirely capable of understanding if Edgeworth wanted to go home, pour himself a glass of wine, and lounge around in a fluffy pink bathrobe—or whatever he did to relax. It’s not like I have a gun to his head, Phoenix thought. Just as he was about to rescind the invitation and cut his losses, the other man came to a decision. “All right,” Edgeworth finally said. “If you don’t want—huh?” Phoenix swallowed the rest of his sentence, not quite sure how to respond. The only thing that sprang readily to mind was asking ‘are you sure?’ which didn’t seem to be the proper sort of reply—and made him wonder why he’d put forth the invitation in the first place if he was so sure Edgeworth would turn him down. Good question. Phoenix really hadn’t thought beyond the spur-of-the-moment overture. This was difficult. He knew all the hamburger joints (there were seventeen) within walking distance because of Maya’s influence, but it was hard to imagine Edgeworth wanting to eat at “Joe’s Burger Shack”. There were also problems inherent in letting Edgeworth choose the restaurant; Phoenix didn’t relish the thought of paying approximately the same for a plate of food as he did his monthly electric bill. “I’ll meet you outside.” Phoenix said, motioning to the exit. He assumed Edgeworth had parked in the underground lot available to attorneys instead of the public parking garage out front. Edgeworth nodded again before turning around and walking away. His quick footsteps seemed loud against the marble floor; by this point in the evening the building had mostly cleared and the low hum of voices no longer filled the lobby. Phoenix watched him until he took a sharp left at the first hallway and disappeared out of sight before exiting out the front of the building. It was late enough in the evening that the heat of the summer day had mostly dissipated along with the setting sun, leaving a chill in the air. Phoenix settled against one of the thick, Corinthian columns that held up the overhanging eaves of the courthouse and waited. As he leaned and watched, people came trickling out of the courthouse. At first it was mostly men and women in neutral, dark suits, badges proudly affixed to their left lapel, but as time passed they were mixed in with more ostentatious people in brighter colors or stranger clothing. A girl that looked about sixteen bounced by, dressed in a navy blue jumper dress and white blouse, hair done up in a French braid. He was sure she was someone’s daughter until he caught sight of the telltale badge glinting in the failing light. He shook his head. …must be from Europe. Phoenix checked his watch. Fifteen minutes. He turned his focus back on the people walking by. One vaguely familiar blonde woman, wearing a slinky, form-fitting red dress and elbow-length silk gloves, looked like she had gotten lost on her way to some Hollywood party—back in the 1940s. Prosecutor, Phoenix wordlessly labeled as she stomped past him and down the wide courthouse steps, shoving aside anyone unlucky enough to get in her way. Whichever she was, it didn’t look as though her case had gone very well. But red dresses, teal suits, slashes of black, and braids alike, none of them were wearing a maroon suit and ruffles against their neck. He felt nailed to the spot, watching as the courthouse slowly emptied and its occupants moved on to their people to see and places to go. Phoenix found his head turning towards the exit every time the doors swished open—still no sign of Edgeworth. Phoenix glanced at his watch again. What’s taking him so long? He tried to drum up some good, self-righteous indignation over being made to wait for more than half an hour, but the heavy, sick feeling in his stomach was too distracting. It was hard not to feel conspicuous and vulnerable as everyone walked past. Just as he was about to go in and look for the other man—or verify that his car was gone—Edgeworth appeared out the front doors, scanning the area. Relief washed through Phoenix, quieting the knots twisting in his stomach. When their eyes met, Edgeworth raised his hand in an awkward half-wave and walked over to where Phoenix stood. Phoenix nodded and fell into pace beside him. “So, which way?” Phoenix asked as they walked down the steps together, feeling not only relieved, but also unaccountably lighter at Edgeworth’s reappearance. Don’t get too enthusiastic, Edgeworth. I might think you actually want to be here. Despite the sarcasm, the grin on Phoenix’s face never wavered. No matter how dour Edgeworth’s attitude, Phoenix was vaguely surprised to find he was genuinely looking forward to the evening more than he had anything in a long time. The first set of blocks that stretched east from the courthouse were acutely familiar to Phoenix; Maya had dragged him in this direction fairly frequently in the immediate aftermath of a trial, as that happened to be the general locale of her favorite burger joint. He'd long lost count of how much money he had spent appeasing his assistant's apparently bottomless stomach; for a moment he almost dared to hope that this excursion would prove a little easier on his wallet. Then he remembered who he was actually with, and the brief flicker turned to ash as soon as it had sparked. Beyond the scope of Joe's, however, was mostly uncharted territory. While sitting in a booth with Maya, and occasionally Pearl, Phoenix remembered that a few of the places he could see in the distance from the window seemed fairly ritzy—he supposed that what had compelled him to choose this direction to take Edgeworth, who had been mostly silent since they had begun to walk. Truth be told, it was a strange feeling. He couldn't recall a time when he and Edgeworth had walked calmly, side by side, not facing each other from opposite ends of a courtroom or rushing across gravel to break into a celebrity's house and rescue hostages. Edgeworth's stride was as brisk as when he walked out of court, and Phoenix had to step up his own pace to keep up. “Have you been in this area?” he asked. “Once or twice,” Edgeworth said. Try being a little more succinct, Edgeworth. It could do you some good. You could work on being less specific, too. Still, with that in mind, he let Edgeworth take the lead, content—he supposed—to follow beyond his footsteps and eyes trained on the back of his head. The silence had once again taken its rein, despite his best efforts. His eyes scanned the line of restaurant names and establishments that they passed; most of them were places he himself would have been more than happy to stop in for a quick soup and sandwich, but judging from the way Edgeworth's footsteps didn't even slow as they passed, they didn't register so much as options in the prosecutor's mind. Phoenix stopped—one particular building had caught his eye. Edgeworth made it a few more paces forward before realizing that his shadow had abruptly disappeared; he glanced backwards and then turned around to join Phoenix. The rich, dark color alone stood out from the other buildings, with the bright décor and neon signs apt for casual diners—the way it loomed, the balcony protruding outwards from the second floor, the carved wood highlighted against the dim light of the streetlamps a few yards out, brought to Phoenix's mind the image of rich wine and—dare he say it—maybe even wealthy prosecutors in cravats. But more than any of that, the thing that had caught Phoenix's attention was how familiar it seemed. It puzzled him—then it clicked. The polished wood carving and the feel of something ancient and unmovable reminded him of the old library from Ivy University, where he had spent countless days and nights poring over legal books, amongst a few other things. It really has been years, huh. Funny how it had slipped his mind so easily. “It's German, Wright,” Edgeworth murmured. His voice was surprisingly free of disdain. I guess you'd know, wouldn't you? Personally, Phoenix still couldn't hear the word 'Germany' without forcing down the instinct to duck and cover for any potential whip attacks. They lingered outside. Phoenix stuffed his hands into his pockets and glanced at Edgeworth; he wasn't sure he wanted to be the one who suggested the place outright. But Edgeworth met his eyes; one of his eyebrows flicked upwards in an expectant sort of well? Phoenix shrugged, and pushed the doors open. It seemed to be as firm a consensus as they were likely to come to. It was like stepping into a cave paneled entirely in dark wood. Age and quiet care gave it a warm sheen in the low light; this was clearly a place well traveled over the years. Directly in front, there was a staircase leading up into what Phoenix assumed was the main seating area of the restaurant. Over to the right, Phoenix noticed a bar with a few patrons silently nursing their drinks. “Do you have a reservation?” someone said, traces of a German accent clear in his intonation. Phoenix started; in the dimness he hadn’t noticed the headwaiter there over by the stairs. “That’s fine,” Phoenix said quickly. At this point he didn’t care if they had to eat in the kitchen; he was hungry. The headwaiter led them up the stairs, which creaked and moaned under their feet in a way that brought to mind old, turn-of-the-century houses. They made their way past several occupied booths and tables. Perhaps it was because of the atmosphere—maybe all that wood soaked up sound like a sponge did water—but even the boisterous laughter at one of the large tables tucked into a corner near the head of the stairs seemed muted, as though from very far away. When they reached their booth, Edgeworth slid in first, then Phoenix on the opposite side. Both took the proffered menus and spent the next several minutes silently studying their options. Phoenix was inwardly relieved to note the regular entrées, while not as cheap as a night at “Joe’s Burger Shack” by far, were still reasonably priced, even if he couldn’t pronounce any of their names. At least the descriptions were bilingual, so he didn’t have to play Russian roulette with his food. Well, if he could find something that looked good. The menu was cramped and, for some reason, he was having trouble focusing, everything seemed to blur together in endless strings of nonsense consonants and vowels. Phoenix looked up. That’s right, he’d familiar with the food too. But Edgeworth was staring at his own menu like he’d never spoken in the first place. “Thanks,” Phoenix finally said. Edgeworth gave no indication he’d heard the reply, so Phoenix bent his head to locate the dish the prosecutor had mentioned. There it was, in the corner. He would have missed it entirely if it hadn't been pointed out to him. Even in print, the name didn't ring any bells. Apparently it was roasted pork of some kind. Eventually Phoenix’s eyes got tired of pretending to navigate the endless umlauts of the German names. He’d long since decided on the entrée Edgeworth recommended anyway. He put his menu down and focused his attention on the man across from him. The shadows from the dim light were long against Edgeworth’s face as he continued to study his own menu like it was a vital piece of court evidence. In fact, Phoenix noticed, he was even holding it the same way. Of all the habits to carry over… Phoenix swallowed a chuckle, but apparently something in his expression showed, because Edgeworth suddenly glanced up. His eyes narrowed slightly, as if daring Phoenix to laugh. Oh honestly, why is he so on edge tonight? Edgeworth sighed, folded his menu, and put it on the table, as though to say ‘you win, Wright’. What Phoenix won, he wasn’t really sure—by no stretch of the imagination was trying to make small talk with Miles Edgeworth some sort of fabulous prize. He struggled to think of something to discuss; talking to his friend could be like navigating an emotional minefield. Finally he decided on something (hopefully) neutral: the case Edgeworth had just finished. Edgeworth paused. Phoenix could practically see the mental drawbridge being raised, before the prosecutor seemingly remembered Phoenix hadn’t been his opponent, and even if he had, the trial was over. “You’d have to ask Detective Gumshoe that question,” Edgeworth replied, gaze growing distant, as though calculating the exact amount an error of that magnitude should cost the detective, in more ways than one. Urk. Sorry, Detective, Phoenix inwardly apologized. Let’s try to get off this subject. “So, it was more like blind luck on that defense attorney’s part,” Phoenix said. I’m not sure an office that employs Prosecutor Payne has bragging rights in that regard, Phoenix thought. “He’s known for that sort of thing?” Phoenix was hardly surprised, judging by what he’d seen in court, but he thought it better for Edgeworth to focus on the defense’s failings than Gumshoe’s. Why do people keep on hiring him? Phoenix shook his head. And then he breaks his ‘one day’ streak with Edgeworth. I can’t imagine that went over well at the Prosecutors Office. Phoenix desperately wondered what was taking their waiter so long. Where were you ten minutes ago? Phoenix couldn’t help but ask as the waiter made his way across the floor in their direction—clearly they didn’t train their wait staff in the “law of good timing” here. At least he looked suitably apologetic. “My treat,” Phoenix said, before the waiter got there. He wasn’t sure if his client would prove to be a deadbeat or not, but he was the one that had invited Edgeworth out in the first place, and it was supposed to be a celebration—which seemed to mean plundering his wallet was expected. Is he doing this on purpose? Phoenix shifted irritably, but held his tongue. He wasn’t about to say no to a night out where he didn’t have to pay for anyone aside from himself for a change. The waiter blinked, ducking and scratching the back of his head as the awkward silence hovering around the booth claimed another victim. “That’s fine,” he ventured, looking to Phoenix. “I’ll have the…” Phoenix trailed off. “This one.” He pointed to his menu. Edgeworth had no difficulty giving the name of his entrée. “Can I get you gentlemen anything to drink?” The waiter seemed to have regained some of his composure now that things were going smoothly. Edgeworth reached for the wine list. Upon reading, his eyebrow quirked in a familiar, small show of appreciation. “If you can guarantee it’s from a fresh bottle, I’ll take a glass of the Vin-Soulier,” he said. Phoenix blinked, but before he could say anything, the waiter had already nodded and bid a hasty retreat. “I don’t really know much about wine,” Phoenix admitted, not wanting to fall back into the pit of quiet suppression. “But I guess that’s pretty good?” If we’re going by price, it must be the equivalent of fillet mignon. My tax dollars at work, Phoenix thought. “How has it been, coming back?” he asked. “It’s about what I expected,” Edgeworth said. “I’ve heard…” Phoenix hesitated for a moment. Phoenix didn’t know how to respond, so he was silent. Edgeworth continued, quietly, almost like he was talking to himself, “If I hadn’t been warned…” Then, louder: “It’s been hard keeping prosecutors. You’ve probably lost count of the scandals making the news. And the higher-ups would rather use propaganda to sway public opinion instead of getting to the root of the problem.” The disgust practically dripped from his words, and Phoenix had to suppress another small smile, knowing he would take it the wrong way. Edgeworth used to get that same—Larry had called it "preachy"—edge to his tone all the time when they were children. Propaganda, huh? Phoenix wasn’t sure what he was talking about specifically, but the idea itself wasn’t shocking. In other words, typical politicians. “Uh, the usual…I guess,” Phoenix said. “There was that big case about six months ago.” It had been before Edgeworth came back. Phoenix was just thankful that it hadn’t, for once, landed one of the Feys in mortal peril. Phoenix had never even been out of the state; it was strange to think of people over in Europe talking about him with Edgeworth. It was even stranger to envision Edgeworth conversing with people—his coworkers. Edgeworth didn’t have much good to say about the people he worked with here; Phoenix wondered if it was different when he was overseas. Had Edgeworth been more social; did he have regular dinner dates, meet people for drinks? Did he have office friendships, smile when he talked to people instead of furrowing his brows in irritation? It was hard to imagine. Edgeworth in any language was still Edgeworth, Phoenix decided. If things had been so much better over there, then he wouldn’t be frowning across from Phoenix right now. “As far as I know, she’s doing well,” Edgeworth said. “As far as you know?” Phoenix parroted, frowning slightly. But that was a year and a half ago! Phoenix blinked. First the year in between the Engarde trial and Iris’s trial, and now nearly another two years without face to face contact. He understood it was difficult to keep in touch when you lived halfway across the world, but when they were in the same general area? “She’s on another winning streak?” Phoenix asked. That sounds like her all right. It was almost sweet, until he remembered that perverse von Karma pride had been responsible for whipping him unconscious at one point. Phoenix pitied the defense attorneys that had to face her after a loss. “You two are considered quite the rivals over there,” Edgeworth said. “What?” Phoenix boggled. He knew the coverage of his cases had been wider the second year he’d been in practice, but that was just strange. What exactly did those newspapers report? He looked to Phoenix for additional confirmation. Phoenix nodded, inwardly shrugging. Might as well leave it to the expert. As their waiter went to get their wine, Edgeworth took the knife and sliced himself the heel of the bread. He buttered it in a quick, easy motion, then took a bite. “Nm,” he considered, swallowing. “It’s not bad.” High praise, coming from Edgeworth. Phoenix reached for the knife himself. With some small difficulty he managed to hack off a small slice—doing it without grasping the rest of the loaf was harder than Edgeworth made it look—and put it in his mouth. He almost spit it back out. Phoenix supposed sourdough bread was lost on him. If given a choice for bread with his meal, it was right down there near the bottom, alongside hardtack. As far back as he could remember he’d disliked that sour flavor and the aftertaste it left on his tongue. He took a large gulp of water, resisting the urge to swish it around in his mouth like mouthwash to get rid of the remaining traces. But as he watched Edgeworth reach for the loaf again, knife in hand, some perverse impulse caused him to pop the rest of the piece in his mouth and chew. Edgeworth looked at him, seemingly amused. “I see you haven’t changed,” Edgeworth said, pausing in buttering another slice. Phoenix swallowed. Come to think of it, wasn’t the first time I ever had sourdough bread at his house? Phoenix couldn’t remember how the Edgeworth home had looked, overall. His dim memories were of a two-story house and long hallways with wood flooring; a large, open kitchen; and a vague feeling of being impressed. It was the first time he’d ever been invited to spend the night at Edgeworth’s house. Larry was supposed to have been there too, but he hadn’t been able to make it—probably grounded. “Yeah, kinda,” Phoenix admitted. Truthfully, his family usually ate dinner a couple of hours previous, but he hadn’t wanted to say anything. “All right, I’ll go get my dad,” Miles said. “No, that’s okay! I’m not that hungry!” Phoenix protested, remembering how serious Miles had been when he’d greeted Phoenix at the door and told him that his father was working so they’d both have to be quiet. He’d somehow gotten the idea that interrupting Gregory Edgeworth was like asking a superhero to stop saving that woman in the burning building and order him a pizza instead. Forget what? To eat? Phoenix thought. Phoenix watched from the safety of Miles’s doorway as his friend padded down the hallway and rapped sharply on the door to his father’s study. A few moments later, the door cracked open and out stepped Gregory Edgeworth. He looked almost disappointingly ordinary to Phoenix, who had been expecting someone akin to Superman in a business suit. He wasn’t even wearing a suit. Instead, he had on a pair of dark slacks and a white dress shirt. The sleeves were rolled up to the elbows; he pushed one up in a distracted motion as he regarded his son. Phoenix walked forward. As he approached, Mr. Edgeworth held out his hand; Phoenix tentatively offered his own and Mr. Edgeworth took it firmly, like he was meeting someone important, instead of his son’s nine-year-old friend. About that time, Phoenix decided Miles’s dad was pretty cool, even if he didn’t look like Superman. “All right, let’s go make some spaghetti,” Mr. Edgeworth said. Miles walked to the large, stainless steel monstrosity and tugged the door open. Standing on tiptoes, his fingers caught the edge of the package on the back of the top shelf and he pulled it out. In the meantime, Mr. Edgeworth had retrieved a stack of mixing bowls of varying sizes from the high cabinets running above the countertops. He then recited a list; it might as well have been in Greek to Phoenix, but Miles nodded and motioned him over to the walk-in pantry, where he pulled himself up onto the shelves—Phoenix couldn’t help but think his mom would have a field day with that. Bracing himself with one foot against a large bag of flour, Miles began searching through and handing down a variety of small glass bottles. Phoenix eventually gave up trying to hold them and used his shirt as a makeshift basket. “Take those over to my dad,” Miles said, as he jumped down and bent over to retrieve a heavy, long, stainless steel pot. Phoenix washed and dried his hands—too slowly for Miles, it seemed, who was waiting with the pot in tow and making impatient noises in the back of his throat. After Phoenix was done, Miles hefted the pot into the sink and turned on the faucet. Phoenix took a place to the right of Mr. Edgeworth, and, a short time later, Miles took a spot to Phoenix’s right. They rolled in silence for a few minutes, Phoenix only stopped when the raw meat grew too cold for his fingers and he had to flex them to make the feeling return. Then, Miles took a glance at Phoenix’s pile. “Really?” Phoenix asked. They didn’t look that different to him. Eventually, Mr. Edgeworth left them to it and began puttering around in the background. The sound of pots sliding on to burners and things being opened and shut filled the air. Once they were done rolling, Mr. Edgeworth rescued their piles of meatballs, popped them in a skillet and the aroma of frying meat and bubbling sauce was added to the overall mixture of sight and sound. “It'll be ready soon,” Mr. Edgeworth told them, apparently amused at the pair of eager eyes perched over his shoulder, watching their combined efforts come to fruition. When the timer went off for the spaghetti noodles, Miles motioned Phoenix over to a drawer and handed him three sets of silverware before retrieving the pasta bowls and water glasses stacked on the counter. He gathered all six of the items up, bringing them over to the kitchen table. Phoenix followed in his wake, glancing nervously at the way the glassware trembled with each step Miles took. Once there, Phoenix got a lesson in table-setting etiquette as Miles corrected nearly everything he set. Phoenix’s family went by the ‘as long as we have utensils to eat, who cares’ rule, but it was impossible to get too annoyed with Miles. It was like getting mad at a cat for being a cat. By this point, if Phoenix thought he'd been hungry before, the time it took to prepare the food—not to mention the smell of it as it cooked—had left him starving. He heaped his plate generously, and saw Miles doing the same. They sat down at the same side of the table, across from Mr. Edgeworth, who passed out a small, individual sized loaves of warm bread before settling down himself. He resisted the urge to forego the neatness and just bite into it, and carefully picked up his knife to try to simulate Mr. Edgeworth's good manners. Not a small bit of effort—and several crumbs scattered his plate and tablemat—later, he eagerly bit into a slice—and nearly choked. It was bitter and curdling—he didn't even know he knew that word—in his mouth. He glanced quickly around the table. Neither of the Edgeworths seemed to be sharing his distress; Mr. Edgeworth, in fact, was buttering his third helping by now. He poked through the center of his slice in what he hoped was discreetly—but peering closely, he couldn't see any green flecks or other signs of mold. When he looked back up, father and son alike had their full attention on him. Mr. Edgeworth's fork, loaded with spaghetti, was halfway to his mouth. “S-sorry,” he stammered out, dropping the damaged slice of bread as though he had been caught red-handed at a crime scene. “All right.” There was a screeching sound against the tiled floor as Miles pushed his chair back to get up. “That's a good thing,” Mr. Edgeworth said. But at least, to Phoenix's relief, he was smiling again. It was like a door slamming in his face. Edgeworth's jaw set and he glared down at the remnants of his bread as though they had suddenly committed a personal affront to him by triggering an unwelcome mention of his father's memory. “…you really haven’t changed,” he murmured, nearly too low for Phoenix to hear. He still hates talking about how it was back then. An odd, icy lump formed in the back of Phoenix's throat—he wasn't sure whether he should apologize or simply change the subject, when the dark shape of the waiter swept in beside him once again, carrying two platters of food. “Very good, sir,” the waiter said, and set it before him. He began to say the name of Edgeworth’s dish, but Edgeworth cut him off with a wordless raise of his hand. A storm cloud might as well have gathered above his head, for all the pleasantness of his expression. The waiter served him his food, clearly perturbed, and quickly removed himself from the scene, leaving them to themselves once again. The prosecutor immediately busied himself in attending to his food—Phoenix didn't even have a chance to get out his intended looks good, doesn't it? —which was apparently too whole and bulky for his tastes. The cutting knife sawed mechanically into the red meat. His mouth was still drawn into a closed line. Phoenix opened his mouth to speak, not sure of what he could say, but not wanting to leave things like this either. Phoenix had managed to swallow two more bites before he realized he was still waiting for a response that had yet to come. He glanced upwards; Edgeworth's eyes skirted briefly across his, and the prosecutor almost looked disoriented, as though he had been preoccupied with his own thoughts to the point of forgetting that he'd been in the midst of a conversation with another person. “Edgew...?” he began, but Edgeworth had already collected himself and was speaking. “What about you, Wright?” There was a certain heaviness to Edgeworth’s words, like they were being forced out of his mouth against his own will. “Huh? Have I been up to Hazakura?” Phoenix’s strongest memories of the temple were of bitter, biting cold and a very long drop from that bridge. Even Maya’s pouting hadn’t convinced him to go back to try to another full course training session yet, no matter how much she insisted he’d be the ‘better lawyer’ for it. “Have you been in contact with Iris?” Edgeworth’s gaze remained firmly anchored to his plate as he spoke. Phoenix nearly dropped his silverware. His tongue felt like it had somehow tied itself into knots, thick and heavy. Where did this come from all of a sudden? Phoenix thought of that low, soft voice, close in his ear when he called her sometimes after work. So similar to the one etched in his memories, but no longer tentative, heavy with the staggering weight of guilt and secrets. And you’re partially to thank for that, Edgeworth. Edgeworth stared at Phoenix with an intensity usually reserved for his witnesses on the stand before abruptly turning back to his meal. He seemed to re-absorb himself completely in the process of cutting his meat into meticulous, bite-sized pieces. “How's your food?” Phoenix half-blurted out. Something had shifted in the air; he suddenly felt strangely light-headed and was at a loss to explain why. “I imagine not.” Phoenix waited for the dry remark about his lack of culinary knowledge outside the wonders of fast food, but it never came. The loudest noise Edgeworth seemed willing to make was the clattering of his silverware against his plate—in fact, it was so conspicuous that he wondered if he wasn't actually doing it on purpose. Phoenix's gaze dropped back to his own plate. He was quickly running out of meaningless questions to ask, and it was becoming very apparent that Edgeworth didn't seem to be interested in playing along regardless. That awkward sense of treading on one another’s toes was gone, and in its place, a feeling of distance. Watching Edgeworth calmly dissecting his food, even though he sat not two feet away, it seemed he might as well be sitting on the other side of the restaurant. Phoenix preferred the awkwardness, honestly. A loud giggle skittered across Phoenix’s consciousness and he turned to stare at the table across the way, where a young woman in a low cut, black ensemble cozied up to an older man that was obviously her date—or her grandfather. Has it always been this loud in here? he wondered. It didn’t seem like it had, the couple hadn’t been here much later than he and Edgeworth. Their own quiet now seemed even further highlighted by the conversations seeping in around them. Phoenix glanced over his shoulder, trying to place the sound of the last voice. Its source seemed to be a frazzled-looking young man, ignoring his plate of cold-looking food in favor of a loose-bound book that Phoenix supposed was a script. Must be an actor trying to cram his lines before the big showing, or something. “You like plays, Edgeworth?” Phoenix asked. I don’t remember him feeling strongly about them one way or the other when we were kids. Television, men’s fashion beyond the 1800’s, due process of law…von Karma didn’t seem like much of a fan of anything aside from his perfect record. The details of the case from—has it really been four years? —floated to the surface of his mind. And his revenge. Hey, I’m not that bad! Phoenix inwardly protested. At least I don’t lounge around in pink bathrobes. “If you had asked me which I thought were more far-fetched, you as a stage actor, or you as a defense attorney...” Edgeworth trailed off. He swallowed heavily, like something too big to say had gotten stuck in his throat, as it always did when this topic was broached. It was back. Like being plunged into a pool of water, every individual molecule of air around them abruptly grew heavier, dampening all noise. As he watched Edgeworth choking on whatever he wanted to verbalize—Phoenix was never quite sure if it was a thank you, an apology, condemnation, or something else entirely—he suddenly felt very tired. This evening had been a textbook example of why he usually didn’t make socialization overtures towards Edgeworth. When it was just the two of them, their combined history weighed like a noose against their necks, strangling any attempts to reconnect on a comfortable, easy level. Sometimes it seemed like the only thing they had in common at all was a shared childhood, and even that was a time Edgeworth appeared more than content to forget. Phoenix looked up, startled. Edgeworth’s eyes pinned his, and, for once, Phoenix was the one that broke contact first. He was sure that hadn’t been what Edgeworth was trying to say, but an odd flash of vulnerability had seemed to surface on his old friend’s face, before it vanished in a blink. He’s trying too, Phoenix realized. Edgeworth chuckled. Something around them seemed to break. To Phoenix's surprise, he felt his own laughter beginning to bubble in his chest. Edgeworth paused, then seemed to relax. The atmosphere settled down into that fragile air of familiarity. “I see enough of you making a caricature out of yourself in court, Wright,” he finally said, dabbing at the corners of his mouth with a napkin. You could have just said 'no thanks', Phoenix thought, but his own smile had returned. Edgeworth nodded as Phoenix continued to speak, chin resting lightly against the knuckles of his right hand. His fork lay still and motionless against the side of his plate. This is how it should be. The thought came unbidden to his mind, but the more it lingered, the more Phoenix was certain it wasn't unwelcome. Phoenix set his utensils on his cleaned plate. The brief clang it made against the ceramic had a distinctly satisfying ring to it. Edgeworth signaled the waiter for the checks. Edgeworth signed his without so much as a blink, but it was in Phoenix's habit to check just how much money he had managed to frivol away before signing anything. Not crippling. He supposed, as he wrote out the check, he couldn't ask for much more. Edgeworth retrieved his wallet and pulled out a twenty-dollar bill, tucking it inside the little black folder. That’s…a lot more than twenty percent, Phoenix noted, but then figured their poor waiter deserved it for putting up with the schizophrenic table for as long as he had. They rose simultaneously from their seats. The walk back was at a slower pace, but seemed to go so much faster. The sun had already begun to set as they left, but now it was completely dark out. In the distance, office buildings were checkered with the occasional lit floor or office. Phoenix wondered, had he not invited Edgeworth out tonight, if the prosecutor’s own twelfth story office would be one of them. Edgeworth seemed content to match Phoenix’s meandering walk. Alongside them, the occasional car’s headlights made the streets and surrounding buildings melt into blurs of light. They passed a couple on the way, both talking furiously and walking at a steady clip—it was only in hindsight Phoenix realized they’d been holding hands. Other than that, there was no one going or coming their way. The only other sounds were the distant screeching of horns blocks away. Phoenix glanced over at Edgeworth, opened his mouth, then shut it. For once the quiet was comfortable instead of thick. He saw no reason to break it. Eventually, as the courthouse loomed ahead, it seemed less like a destination and more like an end of something Phoenix didn’t want to finish, not quite yet. Instead of walking around to the front, they bypassed the façade and took a left where the sidewalk branched to the entrance of the underground lot. The attendant—it was late, this was probably the final shift—stared at them dully before going back to slowly turning the pages of his magazine. Phoenix’s shifted from one foot to the other and stole a glance into the mouth of the lot. “Can I walk you to your car?” Right after the words left his lips, Phoenix realized they sounded a little strange. 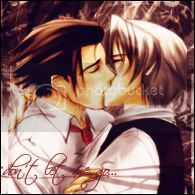 Then, to Phoenix’s amazement, the corners of Edgeworth’s mouth lifted in a brief, but sincere smile. “It was…fun,” he admitted. Phoenix was surprised that ‘fun’ was a good word to describe how he felt too. And he wanted to do it again, though with hopefully less overall discomfort and more actual conversation. He didn’t care how it sounded. Edgeworth paused, like the words themselves had frozen him in his tracks. He glanced over his shoulder and gave a short wave, then kept on moving. Last edited by musouka on Sun Sep 09, 2007 4:38 pm, edited 4 times in total. Anything you like is probably her doing. IN CASE IT ISN'T CLEAR TO EVERYONE BY NOW, MUSOUKA IS A FILTHY LIAR. *EEP*! Man, I'm going to have to rush through the rest of GS3 now so I can read this. Based on the first part this is going to be fantastic. Hahaha, thank Raelle. XD Without her, it probably would have taken another couple of months and wouldn't be half as good. ETA - Christ I sound like some sort of a stalker freak, sorry. I am genuinely looking forward to reading this and I'm not a weirdo (dull and domestic and entirely normal in fact), just for the record. I just love good writing. Location: Sandwiched between Edgey and Phoenix, and loving every minute of it. I just want to say I want to read this SO bad...but I can't, yet. I have to wait till I get and play PW3 first. Gomen (means "sorry"...don't know if everyone knows what it means, LOL, it's a habit of mine I use it all the time), but I'm looking forward to reading this. Thanks Elriel for the wonderful Edgey siggy and the beautiful Phoenix/Edgeworth avy! askdnmjhf YAY. This fanfic is like, really frigging good, and that makes me happy. Keep up the good work, and I can't wait to see more. ;_; I'm so impatient. I am from the internet. It's fantastic. You know that, of course. But I keep rereading it, and I keep loving it because it's so damn superb. I loved the update, but especially the flashback. As someone who despises sourdough, I could sympathise with Nick all too well. I thought you allowed their bond to grow nicely without actually forcing the development; it was good to see that tension between them throughout this chapter, however awkward I felt on the characters' behalves. I loved that part. Just the idea of Nick saying "screw it" and pushing that envelope a tad further made me smile. Thanks to KingMobUK I was able to read at least one of your fics. YAY! I loved "One of these Things is Not Like the Others". I thought it was a very sweet fic and hilarious too. The end especially gets me, I thought that was the sweetest thing and it shows a big step that Edgey is taking by buying him a suit. Phoenix's reaction was perfect. Great Job. I just wanted to let ya know. I absolutely love this story! Watching their friendship awkwardly bloom... this is wonderful. The trial was awesome, and the dinner between Phoenix and Edgeworth... oh, boys. Can't talk long (I'm reading this in class! ) but I'm liking this, and I look forward to more! Notes: Not Chapter 3, sorry to disappoint! This is a side story in continuity with Struggling Against Gravity, though it can also be read as a standalone. It takes place about half a year before the beginning of the main fic, but it meant to be read in conjunction with Chapter Two or Chapter Three. This basically revolves completely around major GS3 spoilers, so steer clear if you'd rather avoid them! Iris had long thought, since the night she had first arrived here, fingers tangled amidst her sister's, that twilight was when Hazakura was at its most beautiful. She couldn't begin to account for the countless changes that had come into her life since the conclusion of her trial, over a year ago. But Hazakura and the bitter cold of its winter was everlasting; the Inner Temple was as creaky and fragile as ever; Heavenly Hall remained something of a battered, private joke between she and Bikini. And she still waited quietly by the Dusky Bridge each evening as the last traces of sunlight began to fade, painting a vast canvas of vivid color across the sky and against the crests of Eagle Mountain. “It's beautiful,” Pearl gasped, both hands wrapped tightly around Iris's arm, standing on her tiptoes to get a better view. She came dangerously close to the edge of the ravine; Iris pulled her back, gently, to where she knew they were safe. It was the first time she had been able to show anyone. Evening had just begun to set in; the air was cooling, and they had just returned inside and lit the hibachi, waiting for Bikini to call them to start preparing supper. Pearl's hair still had clumps of snow in it; even pulling the strands free from their twin loops had not shaken all of them loose. Iris began to fold the squares of paper laid in front of them, smiling. It was difficult not to be distracted by the eager, fascinated eyes shining just inches away from her moving hands. Pearl had arrived yesterday, oversized bags clutched in both hands, stuffed with spare clothes and presents for her hosts. The first time she had come, not long after Iris had been released from prison, it had been without warning; Iris had stepped to the front gate to attend to her usual chores, and dropped her broom in astonishment at the squeal when she prodded it behind the snowmobile to sweep. The smaller girl looked torn between mulishness and embarrassment as she crawled out, snow and ice flecked across her medium's robes and shivering badly from the cold as she tried to stammer out an apology for intruding. Bikini had scolded her heavily. She was welcome at any time; all the silly girl had to do was call. Iris remembered keenly how her eyes had shone nervously as they exchanged cell phone numbers; but her patience had finally rewarded her with a smile on her younger sister's—it had still seemed surreal to think of her that way—face. She was still not sure how to describe the feel of it against her mind—sister had always been a word reserved for a single person in her life, constantly in and amidst her shadow, suffocating and eternal. But it was impossible that the concept of shadow could ever be applied to Pearl, her cheeks flushed, still breathless from the remaining traces of cold, damp hair clinging to the sides of her face, framing her glowing smile. As they set about warming themselves, Pearl—my sister—was watching her, eyes spellbound, as she carefully folded the small square of colored paper in her hands, one corner over the other, molding it into a particular shape. Finally, she pulled the wings apart in one last, easy motion, and the tiny paper crane sat completed on the table before them. By the time they were through, a dozen of the decorative birds were staring back at them from the table. They seemed to form a rainbow of color amidst the neutral scrolls that covered the walls of the main hall. Iris tensed. The last crane that she had reached to perch on the table nearly toppled over onto the floor. Pearl stared; the last bits of ice were finally beginning to melt, and water dripped from the ends of her hair. It gave her the impression of being very small. Iris reached over to pluck a blanket from the corner of the room, draping it around Pearl's shoulders to keep her from getting her robes too wet, gently pulling the ends of her hair free from beneath it. Iris's hands went still. She was still something of a coward, after all. “My sister taught me,” she said, quietly. “I don't know, really.” It had seemed natural, growing up, that Dahlia had the answer for everything; no matter how Mother screamed, or how stony Father's silence, or what they faced both together and apart—Dahlia always held the key, was always cunning, always had a dozen plans brewing at once to ensure their security. She was a person who had arrived at Hazakura with a photograph of a diamond and an exact plan as to how to pull it from the clutches of their father, clever and ruthless enough to leave Iris speechless; given that, the fact that she seemed to be born knowing such small things as how to fold origami seemed strange to question. “Did you play together with her a lot?” Pearl wondered. Iris hesitated. “Huh? Me?” Pearl's eyes widened. “Paper cranes, right? On a string...? Umm...” Her eyes flitted to the side; she raised her right thumb to her mouth, visibly nervous. After a few minutes, glancing back at Iris's curious expression—she had tried to keep it restrained at curious without quite treading on hopeful—she broke into a sudden, forced smile. So Mother took them down after all. A high-pitched wailing sound from the kitchen interrupted them. Another smile touched on Iris's face as she watched her disappear around the corner into the kitchen, loose hair bouncing off her shoulders, humming still audible. She re-entered a few minutes later, ceramic tray heavy and oversized between her tiny wrists, trying not to wobble the kettle or the cups too much before she finally set them down with a sigh of relief. After Iris had poured, Pearl carefully turned her cup around on the palm of her hand, making sure to keep her shoulders properly straight as she sipped primly. Iris watched her fondly. “It always tastes better when I'm up here,” Pearl noted, a thoughtful chime in her voice. She began to raise her sleeve to wipe her mouth, then caught herself and looked thoroughly embarrassed at her close brush with such bad manners. She blew softly over the surface of the steaming liquid, before raising the cup to her own lips. It burned down her throat, soothingly, giving way to a rush of warmth just beneath her skin. The smaller girl blushed, and reached up to nervously tuck her head under the damp towel, covering her eyes. She made a tiny sound that Iris supposed was meant to be thank you. Iris reached out to slide the edge of the cloth back from Pearl's forehead, so that her bangs came loose. “Where did you learn?” Iris asked, gently. Pearl's eyes widened. “U-um, you know...” She bit her lip, staring down at the floor. Her fingers danced around the edge of the towel, playing out an internal battle to hide her face once again. Iris nodded, encouraging her on. “My... my mother taught me.” Her hands curled into tiny fists in her lap as her eyes darted quickly to the side. She had expected it, but it fell like a weight between them all the same. Mother and Father were more shadows than people to Iris's recollection—she could remember that they had fought often, voices resounding off each others' through the walls and the floors trembling with the force of their rage at one another—though Morgan Fey had always seemed caught between fury and despair no matter who the target and what the cause. Looking back, no longer having to cower in fear as a periphreal target of her anger, a part of her found her mother almost pitiable instead, wailing and wretched for the irreplaceable things she had lost through clenched fingers. Father's face was lost to her entirely—there was the vague outline of his back, cold and distant, as she had watched him walk away from her for the last time through the gates of Hazakura Temple. Pearl had never known him, but Iris supposed her understanding of her own father, leaving behind his own daughter in the wake of a power-hungry wife and his own lack thereof—the same tragedy, spun with different players every time—probably wasn't very different. Her memories of the village of Kurain itself were blurry and faint. Try as she might to remember the look of the traditional buildings, the feel of the cool dirt paths beneath her toes when she and Dahlia had snuck out of their room, the one solid image she had to cling to from that time was the image of her sister's profile, staring defiantly up at anything that dared try bear down upon either of them. The other details were extraneous, bleeding into the framework of her present life at Hazakura, irrelevant. Stupid, Dahlia scowled, knocking the ruined paper cranes from her sister's hands. You're so stupid you can't even do something as easy as that. Iris stared down at her hands. Iris waited. Pearl stared downwards as her teeth bore down on her thumbnail, cup of tea cooling and forgotten on the table adjacent. The cold shock that had torn through her felt as though she had been plunged into ice water—paralyzing, and making the world around her dim and flicker in and out of focus, when Diego Armando had pursed his lips together only for a moment before telling her that her sister's execution had finally been carried out. Dahlia Hawthorne was dead. Pull yourself together, he said roughly, averting his gaze to the wall next to her. Her head had snapped upwards, as she tried to steady her breathing. She had not noticed she had stumbled backwards, her back against the wall. Armando's mouth was drawn in a hard line, as though daring her to mourn. Pearl stood again to refill Iris's cup. The kettle wobbled in her hands, unsteadily, as she poured, and her gaze was intense as she stared hard at it, as though daring it to break. “It must be hard,” Iris murmured. Pearl's head shot up, as though a gunshot had gone off—a splash of tea skewed sideways from the cup and fell against the floor, but she didn't seem to notice. She was still for a long moment before she finally gave a loud sniff—her head inclining again, as though trying to curl in on herself, the kettle settling back onto the table with a clunk. Her lips moved a few times before her voice was actually audible. She had wept in silence, the door locked behind her. She had known it was coming, had known for years, tried to steel herself for it—but could not help feeling blindsided, as though half of herself had been torn away and been lost. Iris reached out, laying her hand over Pearl's. Her shoulders relaxed, visibly, and when she spoke again, her voice didn't shake quite so much. “She did care about me... didn't she?” There was genuine pleading in her voice. Pearl stared; her eyes were suddenly overbright. The towel fell from her shoulders as she raised her hands to wipe at her eyes. “I can't tell them.” The words were so soft as to be barely audible; Iris had to incline her head forward to be sure of them at all. “Pearl,” Iris began, but it was as though a dam had broken; Pearl continued speaking, the wonds tumbling over one another. Her arms moved as though they had a will of her own, enveloping her little sister, and pulling her forward against her. Pearl gave a soft squeak in surprise, and Iris could feel warm moisture blotting her own robes. Iris's grip tightened around her; a part of her wishing desperately it could be as easy as crushing the sadness and guilt out of her. She raised one hand to stroke her hair. Pearl fell quiet. The air around them went very still. She could hear the echoes of the people surrounding her within her life. Cruel and selfish, a person who would cut down everyone and anything to get what she wanted. A person so filled with hate even death couldn't stop her. Demoness. It was the first time she had ever told anyone. Pearl stared at her, eyes boring into hers, reflecting strength she had inherited from her mother. She stood, abruptly, and moved to the far wall, inspecting the lesser magatama closely, hands folded behind her back. “Of course you were,” Iris said, soft. Pearl shook her head. Her arms fell back to her sides, fingers curling slowly against her palms. Iris stared. She could not manage more than a whisper. The sound of footsteps against wooden floorboards sounded abruptly in the distance. Iris pushed herself to her feet; Pearl drew away from the altar to approach her, shyly. “Oh, yes...” Pearl said, vaguely. Iris cast another look at the rows of paper birds they had made together. Pearl's eyes followed her line of sight. Iris held out her hand; Pearl took it, fingers entwining hers. Sharing a secret giggle between sisters, they moved together to the kitchen to begin preparing their evening meal. This is one of the best PW I've read! The characterizations, the writing style... everything is great. And 1000 Cranes is the definition of "cute".